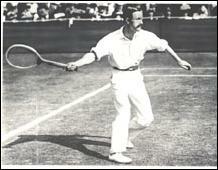 JUST WHAT IS MODERN TENNIS? It's been said that modern tennis relates to hitting with topspin, hitting with an open stance, and wrapping the follow through around. But as the song goes, "everything old is new again." From 1926 comes clear evidence that topspin, hitting from an open stance, and wrapping the follow through around the opposite shoulder were very much in the game at that time. One of author J. Parmly Paret's series of instructional books entitled Mechanics of The Game of Lawn Tennis shows that. J. Parmly Paret analyzed the mechanics of the top pros of his day using high speed photos provided by the United States Lawn Tennis Association, which he includes in his book. Of the 9 forehand sequences, 5 roll the racket over, and 4 hit from an open stance. Paret is the first tennis biomechanist, and as his colleagues today, he eagerly declares that these photos reveal hidden truths and shatter myths. My favorite is his conclusion that pros take their eyes off the ball before it is hit since his photos show many pros do not have their eyes on the ball at contact. Something considered "new" is loading the body weight on the outside foot and exploding into the shot. The three photos below show this "new" idea has been going on for over 100 years. On the left is Arthur Wentworth Gore in 1908, clearly loading on his outside leg and I would bet he's going to slap the living daylights out of the ball. 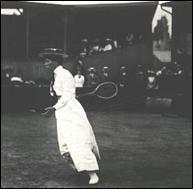 Next we have Miss M. Coles, 1910, with again, an open stance and ready to "explode" into the ball, though we don't know the degree of explosion. She could have just as well hit the ball easily, but the structure is there. On the far right is modern player Manuel Santana, with 4 Slams under his belt, 2 French, 1961, 1964, 1 U.S., 1965, 1 Wimbledon, 1966. He is off the ground crunching the hell out of it. Looks like Federer. So what's the skinny on this? Two things, the observers are slow to recognize, and the business of tennis always wants to sell you some new thing or another. Tennis has always been the same because the way we move and empower ourselves, the game's geometric reality of a ball angling away, and athleticism haven't changed. What has changed is the equipment, the training regimen for athletes, the choices in stroke selection, personal freedom and improvisation when playing, and the money involved. "In each case (golf and tennis), there is a rotation of the body itself on its own base and the more this turn of the hips, trunk and shoulders can be added to the forward swing, the greater power will the stroke have." "In any case, a certain amount of rotation is necessary, and the more it is used the better. "Nothing can cramp the tennis stroke so much as a bent elbow, and it is doubly important that in all ground-strokes, at least, its angle should be obtuse, never an acute angle, if indeed the arm cannot be straightened out entirely." "But if one must choose, it is better to keep farther away than closer than he thinks safe, for it is easy to lean out to reach a ball but a deadly weakness to draw back from it." "Your whole body should be kept as far away from the ball as possible as the stroke is made, and when you lean out to reach it, that idle arm will help greatly in maintaining the balance." "Straighten out the playing arm too and reach far out, for the longer the lever used in making that whipping slash against the ball, the greater will be its driving power." "The weight must be traveling in the direction you want the ball to go when the stroke is made or power is lost. By leaning out to meet the ball [i.e., extending the arm] and swinging the weight forward [i.e., in the direction you want the ball to go] as the ball is hit you carry all the power of the body weight with the stroke." "Let us glance over the list for a moment: 1) A long back-swing; 2) increasing the speed of the racket in the forward swing; 3) meeting the ball with the racket traveling at its maximum velocity; 4) adding to the power by snapping the wrist just before contact is made; 5) turning the body around by rotation to increase the momentum of the racket; and 6) following through with a forward motion of the body to add its weight to the stroke..."
"We find, however, two distinct groups among even the best players, those who set themselves in a fixed position [i.e., open stance] to make the stroke and those who "step into" the stroke or make it on the run." "Much wider latitude for quick action is offered by a diagonal stance, with the right foot somewhat farther from the net than the left. From this position a much quicker start can be made in some directions than from that with feet parallel to the net." What has really changed from 1926, besides the Ready Position? Body rotation and forward motion of the body to increase power is exactly the same as what the USPTA promotes as "modern tennis", as well as everyone else for that matter. "Load, explode, and land" is the term for this new stuff, which is exactly what points 5 and 6 in the Forehand Stroke lead to. Extending on strokes is still very popular, as is shifting your weight toward the other side of the net. And according to Vic Braden you shouldn't believe anyone who says they see the ball when hitting it. Of note, though, is the mention of snapping the wrist on the forehand stroke to add power to the hit. This is the only instance I have found where "snap" is used to describe the wrist motion. I would never use the word "snap" to characterize how the wrist is used on the forehand groundstroke, and I can't remember being told "snap" by any teacher, including Pancho Segura and Welby Van Horn. Of course I haven't seen all the old tennis books, but even the recent old ones by Gladys Heldman and Welby Van Horn I suspect never used the word "snap" to describe the wrist's role. When Vic Braden rails on about how wrong it is to "snap" your wrist on a forehand stroke because he says it does not flex at all I'd sure like to know not only who has used that word in the teaching community (has to be somebody well-known and influential, not some local guy) but in what teaching book it can be found that raises Vic's ire. Point is it's ancient history, shortly lived.